If you’re coming to the Gold Coast for your definitive Gold Coast theme park experience then you might like to consider booking in at Sandpiper Beachfront Apartments at Broadbeach for a few days. Sandpiper Beachfront Apartments offer superb beachfront accommodation at Broadbeach that is close to all the Gold Coast theme parks. At a leisurely 15 minutes drive to the Main Beach location at Seaworld, or 25 minutes north to Movie World, Wet & Wild, Dream World, White Water World, or the Australian Outback Spectacular, Gold Coast theme park heaven is just around the corner. 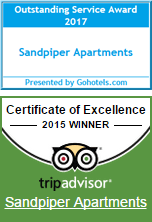 After a hard day at the theme parks, Sandpiper Apartments are just the place to unwind. There’s a large heated pool and spa pool to enjoy and the outdoor dining area also has BBQ facilities for you to sizzle your evening meal. For guests who want a break from cooking, there’s plenty of local Broadbeach eateries nearby. If you want a casual fish and chips meal on the beach or a more upscale restaurant experience, there is sure to be an option that will take your fancy. Also nearby is the Broadbeach Oasis Shopping Centre, with a number of shopping mall eateries as well as a Woolworths supermarket. If you’re planning a break in-between the strenuous theme park outings, the beach is just across the road with two patrolled areas in which to swim, and if you’ve bought your surfboard, there is usually a worthwhile set of waves to catch. You will find Sandpiper Beachfront Apartments at Broadbeach on the Gold Coast comfortable with stylish accommodation options. With their delightful ocean views, expansive tropical gardens and large pool that is heated all year around, this Gold Coast accommodation option will complement your theme park adventure. Call us today to book your Gold Coast Theme Park Accommodation at Broadbeach.